Branded CRE brochures, property tour books, availability, lease, activity reports with a few clicks. You can generate commercial real estate flyers, property profile reports, brochures, lease comp reports right from your Salesforce CRM with Composer. Composer pulls data and property images from your CRM and converts them into attractive brochures and reports. Generate reports in PDF and PowerPoint. Use prebuilt report templates to generate the reports or brochures. New templates and microsites functionality are coming soon. Download reports, send as a link or as an attachment via an email. Sent emails are tracked as activities in Salesforce. Send reports to multiple recipients. Available for anybody who is a subscriber to the Salesforce’s Sales or Service cloud. 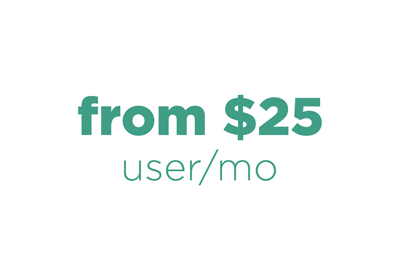 Composer is from $25 per named user per month. Get as many licenses as you need. We have special pricing for Nonprofits. Contact us to learn more. Save 10+ hours every month. Keep your clients up to date with little effort. Generate attractive reports and flyers in minutes. Composer is easy to use and no training is needed. No need to enter property information or add images manually. It is very affordable. The price is only $25 per user per month. Stand out from your competition with professional-looking reports and brochures. No integration is needed. Install our app from AppExchange and start using it right away! Composer is a multifaceted tool. Create marketing brochures, various activity reports and documents. Ascendix Search, our productivity-boosting tool, is included! 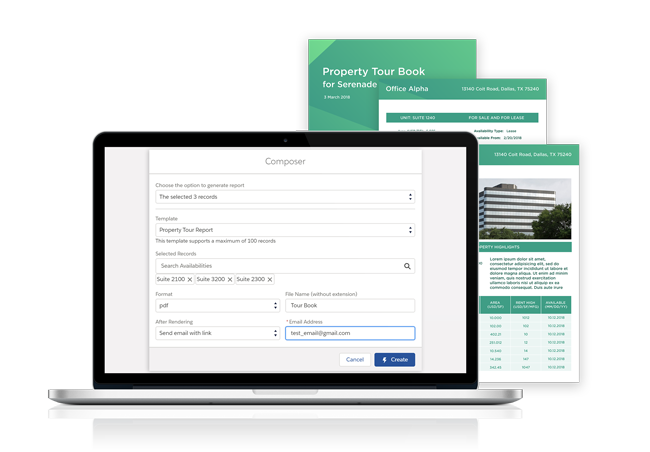 Composer helps tenant rep brokers generate professional-looking property reports with the data right from their Salesforce CRM. Select properties or availabilities you want to include in the report. Choose an appropriate report template. Decide to download or to send the report via email. Click the Create button. That’s it! The property availabilities report contains the automatically generated map with addresses of available properties, their images, high-level property overview and availability details. All this information is pulled from your CRM. A few clicks and you are ready to send a professional-looking report with up to date information to your prospective tenants. Keep property owners updated as to how their property listing is performing. With Composer, you can quickly generate activity, inquiry and deal reports. Now it is easy to keep property owners updated and happy with your service. It is easy to try. We offer a 30-day free trial with no obligations. Start creating various commercial real estate brochures and reports right now.